For the last year, I've been looking at my disorganized bin of solid scraps (aka the stringy wad of shame) and trying to come up with an idea of what to do with them. I would look, consider, feel overwhelmed and guilty and then quickly come up with something else to piece to distract myself. No ideas were coming and I felt stuck. I really, really, REALLY hate stuck. The turning point for me was a desire to clean up. I knew I didn't have any ideas about what to do with the scraps, but I thought at the very least I could organize myself better. I spent two days at my ironing board, unwadding, trimming strings, pressing and neatly folding. I was genuinely surprised at how much I liked it. Somewhere in the middle of all that organizing, they stopped being guilt-inducing scraps and morphed straight into fabric. And, as we all know, fabric is fun. 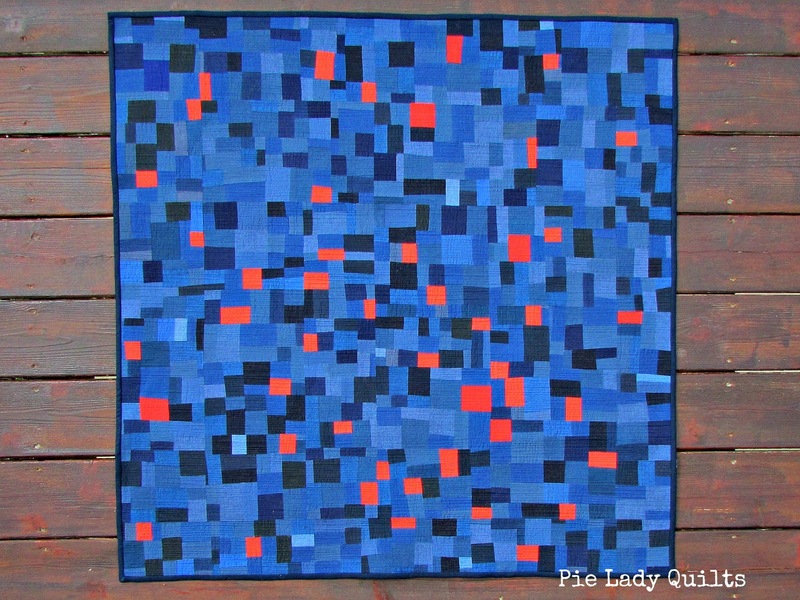 The first quilt that emerged from my cleanup was "Accentuate," and it was inspired by a childhood memory. As many of you know, I am from a small town in Idaho. In the summer before my fifth grade year, my mom took me to "town" to do some school shopping. I walked into the Fashion Center and saw a pair of fuschia purple overalls that stopped me in my tracks. Of course they fit, of course I had to have them and of course there was no shirt in the store that would work with them. A sweet clerk, overhearing my despair that nothing matched my beautiful overalls, quickly came to the rescue. "Sweetie," she said, "Stop thinking about matching. You need to accentuate!" She scanned the racks, pulled out a turquoise shirt and a teal belt and brought them over. I was in love. For the rest of the year, I carefully worked out my laundry schedule so I could wear the outfit every Monday, Wednesday and Friday. Those colors are just magic together and I found as I went through my scraps that I had many different variations of those shades. Apparently I still like them! All that nostalgia put me in a fun frame of mind, so I started piecing simple purple shapes (with belts!!) and setting them in the deep teal color. I made the decision to use all the teals, and just tried to have fun making new shapes in the background. I also used all the purples with the hope that it would look like I was aiming for depth instead of desperation. My three color quilt ended up using 10 different fabrics. "Accentuate" finishes at 37" x 37." I used Quilter's Dream Request batting and Aurifil monofilament thread to do matchstick quilting. The best part is that I went shopping right after I finished this quilt. I found a sweater that I loved so much in the same radiant orchid shade I'd just been working with. I asked the clerk if the sweater came in any other colors, and she pulled out versions in teal and black. I thought it was rude to laugh the way I was in front of her, so I had to pull out my phone and show her a picture of the quilt. I feel so much better having these colors back in my closet! I went back to my scrap pile and found that I could still identify fabrics from specific quilts. I had a lot of scraps left over from "Heading West." I love that quilt, but I have a lingering dissatisfaction that I chose to do the matchstick quilting with a gold thread. The positive is that the thread gave the finish a soft glow, but the negative was that it dulled my color work. I decided to do a reprisal of "Heading West" and try quilting it with monofilament thread. 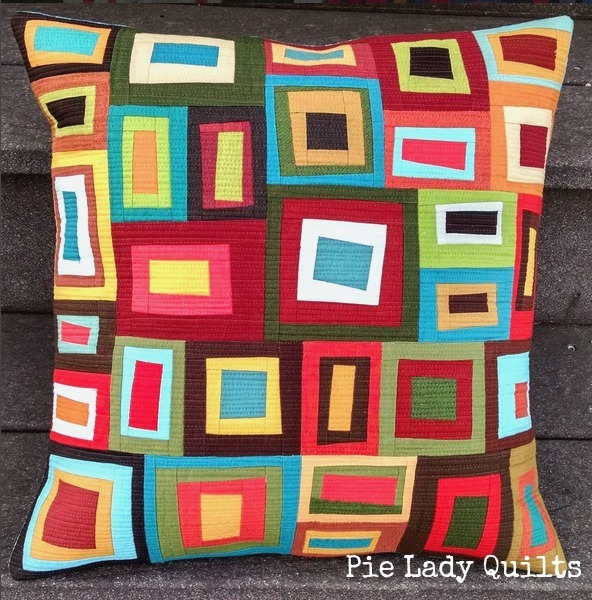 I made an 18" square to turn into a pillow cover. I posted it during the Instagram Quilt Fest last month and got about triple the likes I've ever had on a photo. I think that means that the monofilament experiment was a success! 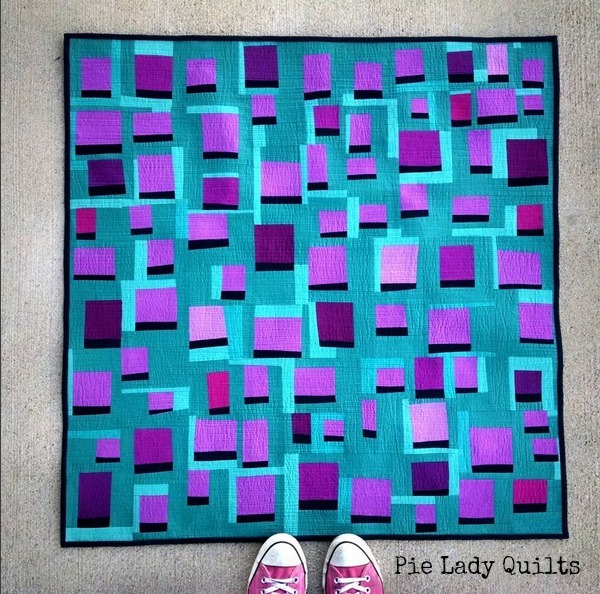 One of the prompts from the Instagram Quilt Fest last month was a "fast finish." I decided to play along and turn one of my nothings into a something. I made a block last year using Kona Highlight that I never did anything with, partly because I'd had a construction issue and ended up with a bubble in the middle. I pulled that block out of my parts department and tried to think about how I could fix it. In the end, slicing through the bubble was the only way to move forward. I made two improvisational cuts through the center of the block, flipped the inner pieces toward the outside and turned to my solids scraps for inspiration. I filled in the gaps of where I'd cut with some pieces of a garnet colored fabric that was left over from piecing "Accentuate" and sashed each piece with blue. I also decided to hand quilt. I used Aurifil 12 wt. for the quilting and some hand-dyed thread from Weeks Dye Works to do the seed stitching on the garnet fabric and on the purple squares. I knew that I was going to run out of the color I was using to do the seed stitches in the cross, so I tried to run out in a strategic place. I had to fill in the center of the cross with a slightly different shade, but I ended up loving the subtle glow it gives. This quilt finished at roughly a 20" square. I created this next quilt from some Handcrafted prints and scraps from my solid bin for a challenge from Curated Quilts. Participants are linked to a Pinterest board for color and design inspiration. I enjoy creating when I'm given parameters--in some ways it takes the pressure off. The inspiration board had a lot of architecture and lines, so I attempted a mosaic quilt with some fusible web and a pair of tweezers. 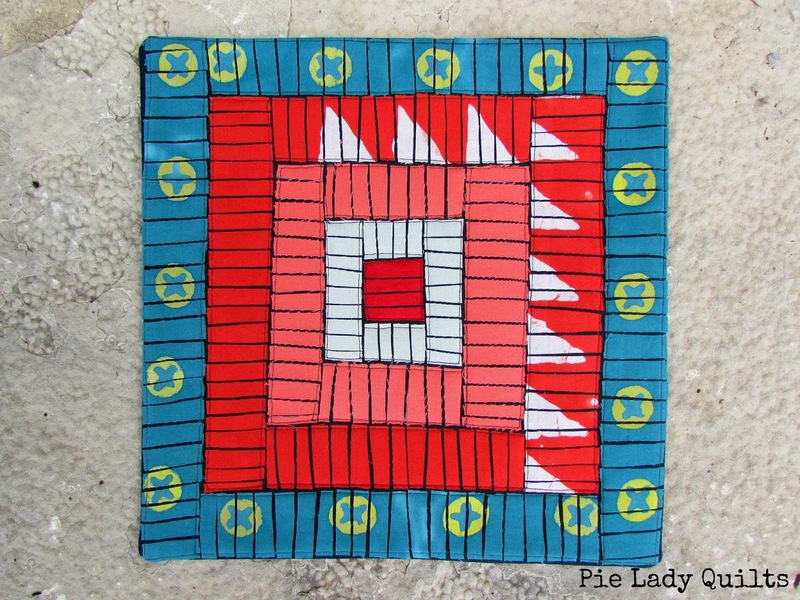 This tiny quilt is only 11" square and was so fun to make. Basically you fuse your fabric down on a background piece of fabric (I used black) and purposely allow the background fabric to peek through like mortar would. I fused the fabric in place and stitched along either end of the fused fabrics with black thread. It was fun not to have to account for seam allowances when playing with the patterns in the fabric. I also discovered that this method works really well with batik fabrics because you don't get as much fraying. This challenge doesn't close until May 1, so there is still time to participate if you are interested. Follow the link above for more details. The line, "Central Valley Sunshine" stuck in my head on a looped track until I dug in the bin for fabrics that evoked what I imagined it to look like (I've never been to California). I used a combination of solids and nearly solid prints. Originally I was thinking that I would make striped units, and I did. I liked them, too. I was eyeing up the design wall and thinking that one of my striped sets looked a little clunky, so I tried slicing it down the center longwise, flipping one piece 180 degrees, and sewing it back together so it looked like a checkerboard. I may have liked the stripes, but I loved the checkerboard. Naturally I had to slice up all of the striped units and make checkerboards instead. Depending on the width of the strips, the shapes created when recombining varied dramatically. I had a great time experimenting with the widths and the shapes. I love how one simple method can lead to such a variety of effects. "Central Valley Sunshine" finishes at 42" x 42." 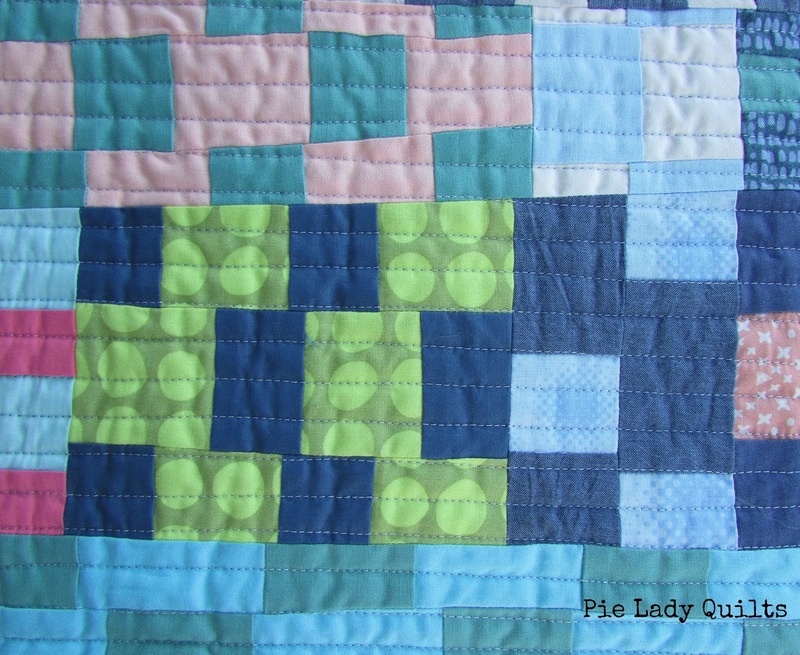 I used Quilter's Dream Request batting and quilted it simply in straight lines with silver Aurifil thread. I ended up using a piece of voile I had in my stash as the backing, since voile comes in wider widths than regular quilting cotton I was able to avoid a seam down the back. I also lucked out and had a piece with a linear motif, so I quilted it from the backing side and used the pattern as cheater lines. The part of my brain that embraces improvisational piecing is the same part that struggles making straight lines, so I take all the help I can get. Would you like to hear the song for yourself? Here's a link. 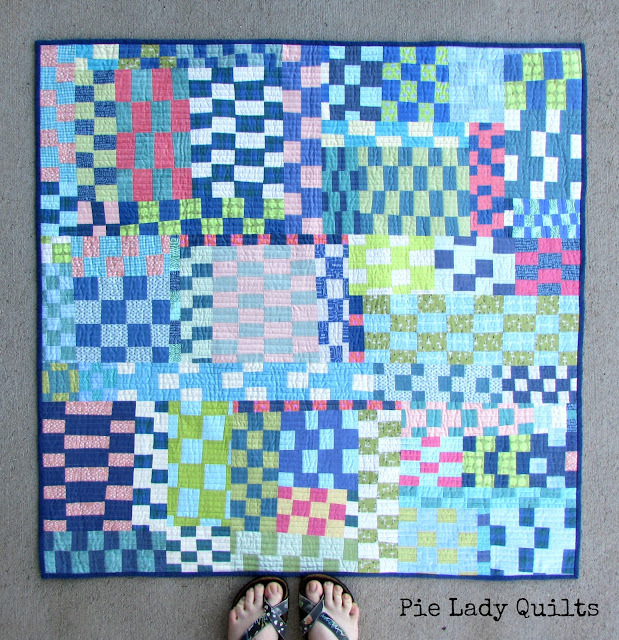 Finally, I'd like to end with the quilt that was the namesake for this blog post. "Spark" started as a failure and an accident. 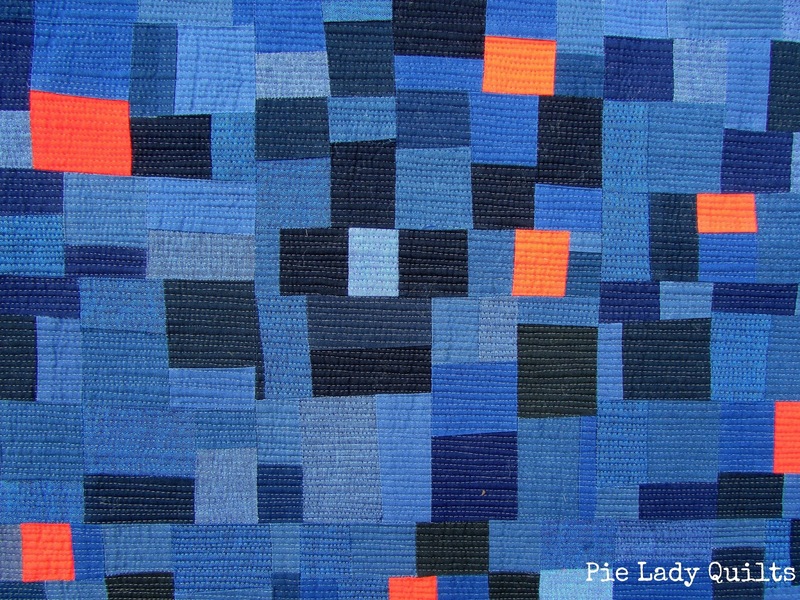 I was playing around with another idea that I'd had and devoted an afternoon to piecing some shapes with my blue scraps. It was not a success. Normally I'm an optimist and am prone to reworking and reworking until I like something, but this experiment I was not feeling AT ALL. I put the blue pieces of fabric back in the scrap bin and pulled out a medallion quilt that I've been slowly working at for the last month or two. I added coral rows to the center and had to put it away again because a lovely accident had just happened. I tossed a strip of leftover coral fabric on top of those blue scraps and fireworks lit off in my head. The coral pieces just rocketed off those cool blues and I knew I had to make that quilt. 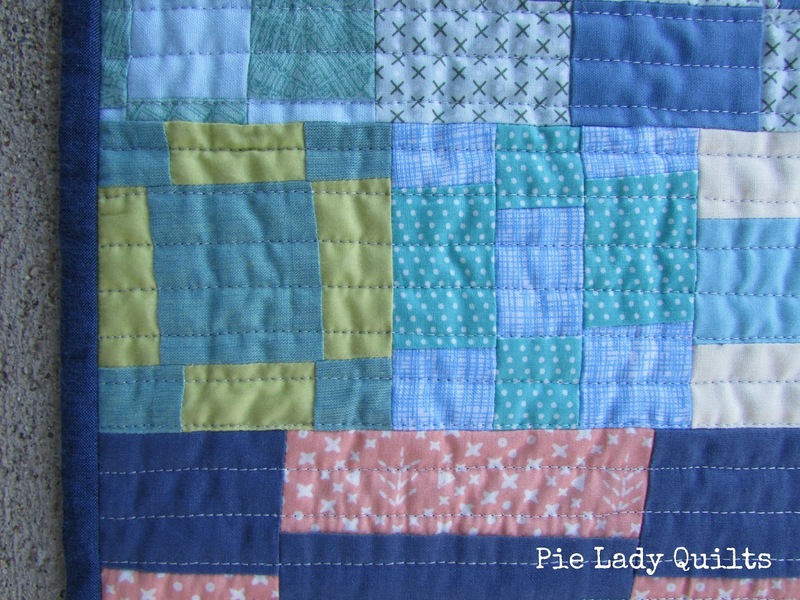 I had many small scraps of blue, so necessity was the inspiration for the tiny squares. I built this quilt out like a medallion quilt and tried to judiciously add scraps of coral when I thought the quilt needed them. I also had a good time hiding subtle shapes in the blues. 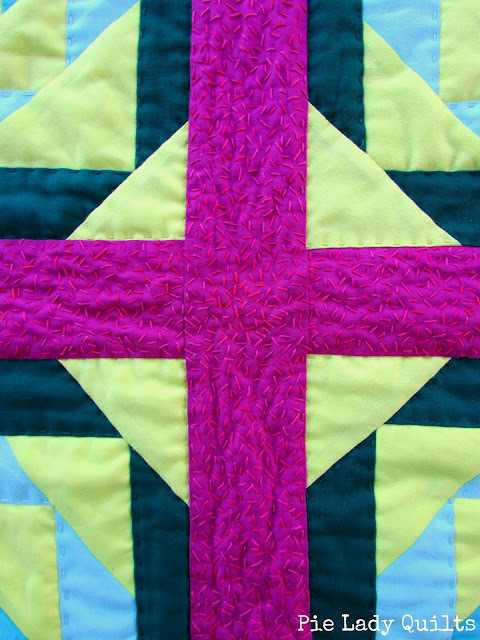 If you haven't taken the Gwen Marston classes from iquilt.com, I'd highly, highly recommend them. She made a comment in one of the classes (I don't remember which one), that if you have the opportunity to put blocks together in such a way that you create a new shape, that you should probably take it. Looking back at the last few quilts I've made, I can see myself trying to take that advice. It's definitely altered the way I think about "backgrounds." "Spark" finishes at 38" x 38." I used Quilter's Dream Request batting and quilted it with Aurifil monofilament thread in a matchstick pattern. 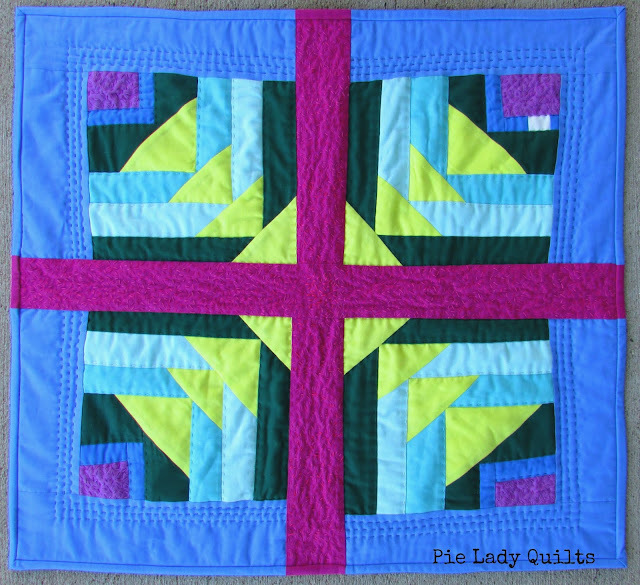 I know I do that a lot, but it is because I love texture and I love highlighting the piecing. 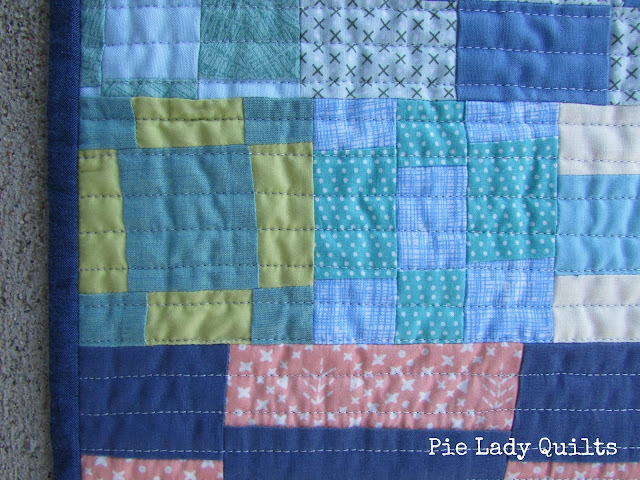 I've found that the more quilting lines there are, the more visible the piecing is. To sum up, what is my advice for using your scraps? Don't be an obsessive idiot like I was and wait for inspiration to strike BEFORE you begin. Fate favors the prepared and inspiration flows more freely for me when I am working. Touching the fabric, sorting it, remembering what exactly you have all helps to release the creativity and can be the SPARK that gets the fire burning. Linking up to Finish it up Friday at Crazy Mom Quilts..